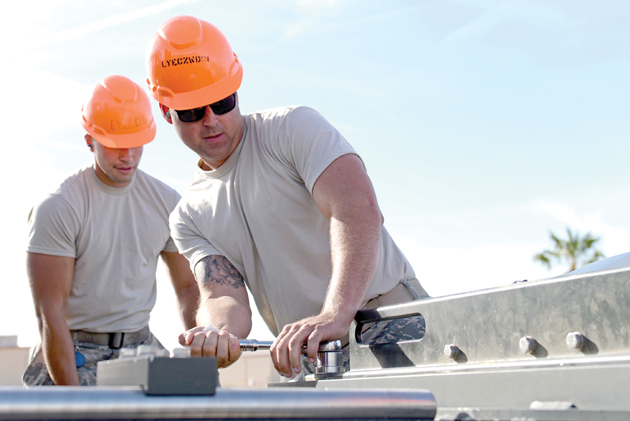 Members of the 56th Equipment Maintenance Squadron Munitions Flight set up bomb assembly utilities June 6 at Luke Air Force Base. Members of Luke’s team for the Air Force Combat Munitions competition, which took place June 11-14 at Beale Air Force Base, California, were selected from different sections of the munitions flight based on merit, ability and diversity of skillset. 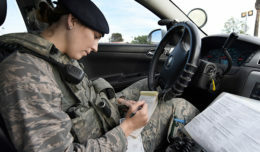 Members of the 56th Equipment Maintenance Squadron munitions flight formed a team to compete in the first-ever Air Force Combat Munitions competition, which took place June 11-14 at Beale Air Force Base, California. The competition challenged seven teams of ammo maintainers from bases around the world to compete in various tasks that simulated the range of activities required in live combat munitions operations. Each team is allowed a maximum of 10 members with a limit on the number of individuals who meet certain skill levels. The members of Luke’s team were nominated by their respective sections in the munitions flight based on their strong work ethic and high level of competency. Luke’s team trained daily since their formation in February. In addition to preparing them for the competition, their practice reinforced important operational skills, which will allow them to uniquely excel as functional technical experts. The team was optimistic about their chances, and fully intended to impress their ammo peers.